Joe Iaciofano won’t feature for Corby Town as they look to secure survival in the Evo-Stik Northern Premier League Premier Division. It was confirmed this afternoon that the young forward was recalled by Northampton Town to be part of their first-team squad for this afternoon’s Sky Bet League One clash at Bury. 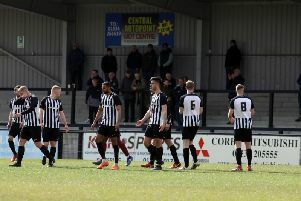 It means the Steelmen will be without him as they look to complete the great escape from relegation in their final game of the season at Coalville Town. Iaciofano joined Corby on a work experience deal in early February and has played a key role in the Steelmen’s revival in the past three months or so. He scored four goals in all competitions and, despite the setback of him returning for Sixfields before the end of the campaign, Steelmen manager Steve Kinniburgh paid tribute to him for his efforts at Steel Park. “Joe has come on leaps and bounds being at Corby,” Kinniburgh said. “His attitude has been first class and he deserves his opportunity to show what he can do. “We would like to thank Northampton Town for letting us have him, I think he has developed since he has been here and that is the way we want to be with any other future loan signings we may get from clubs at a higher level. The Steelmen go into their game at Coalville Town knowing they will escape a second successive relegation if they match or better Sutton Coldfield Town’s result in their clash at Workington.